The Personal Safety and Security Playbook is designed for anyone who may benefit from shared community safety and security responsibilities. Chapters are organized by areas of concern, from personal risk awareness to protection and security considerations for family, home, travel, and work. The guidelines included help the reader recognize personal safety and security hazards, take proactive prevention steps, and react reasonably to danger with beneficial outcomes. A full chapter of local and national resources for personal security is included at the end of the Personal Safety and Security Playbook. 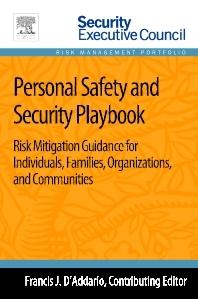 The Personal Safety and Security Playbook is a part of Elsevier’s Security Executive Council Risk Management Portfolio, a collection of real world solutions and "how-to" guidelines that equip executives, practitioners, and educators with proven information for successful security and risk management programs.